Something got into me this weekend, and for no apparent reason, I had the desire to use Nutella. I normally don’t buy Nutella and it has been awhile since I’ve had a Nutella sandwich. 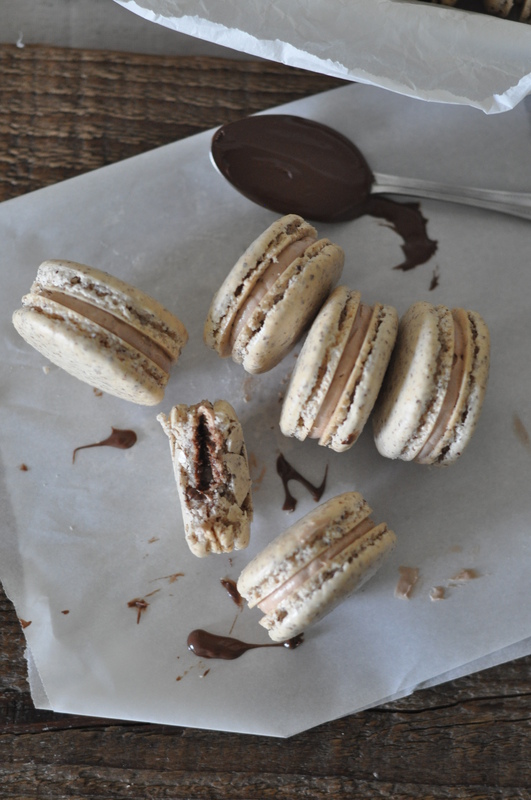 In fact, it was about 8pm on Saturday night and I convinced my husband that we had to go get a jar of Nutella so that I can have it available the next day to complete my macarons. Nutella consists mainly of hazelnuts, skim milk and cocoa and is traditionally used as a spread. 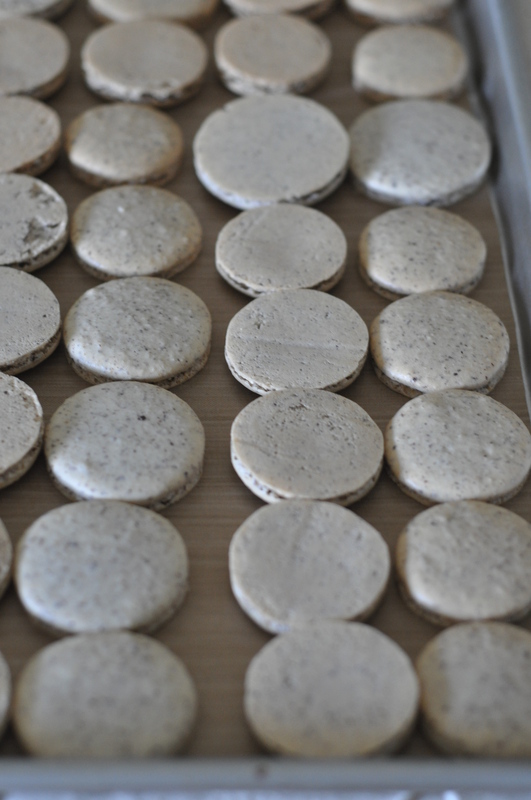 I used the Nutella to flavor the buttercream and for the macaron shell I opted for all hazelnut flour and no almond flour, where as when I made my hazelnut macarons I used a mixture of both flours . 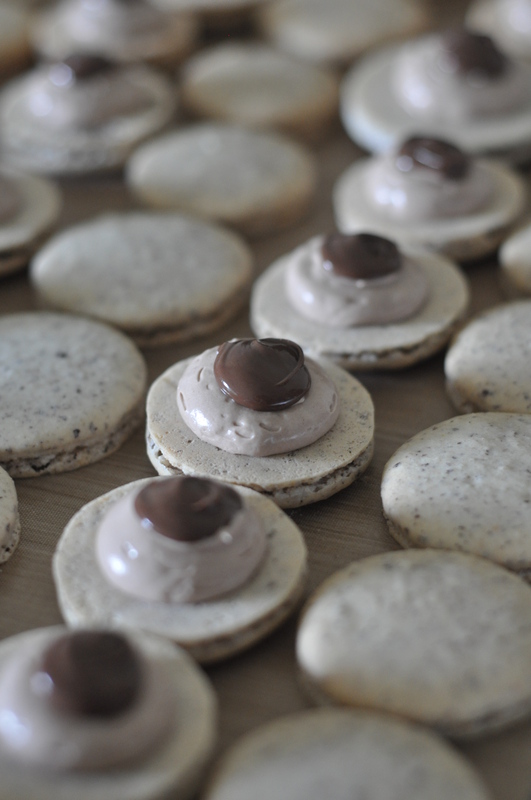 To give the macarons an extra pop of Nutella flavor, I piped a dollop of Nutella in the center of the buttercream when sandwiching the cookies together. 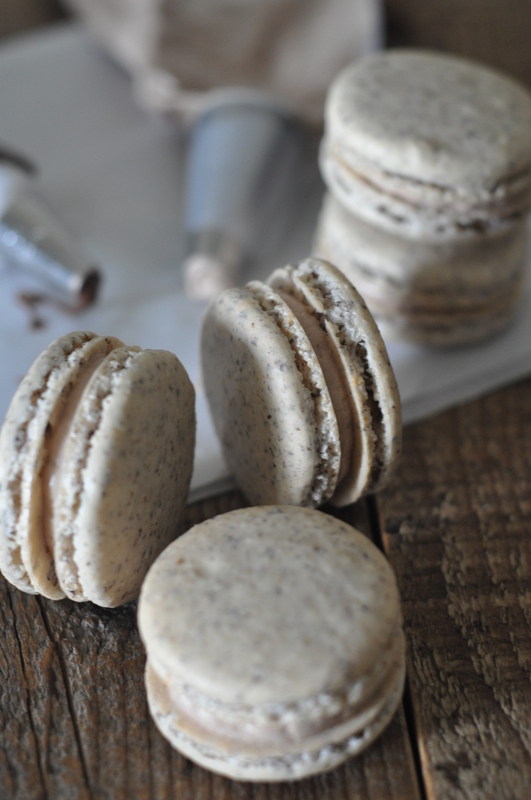 Needless to say, these macarons were quite nutty! First fill with Nutella buttercream in the center. Then pipe a dollop of Nutella on top of the buttercream for extra flavor! In a food processor, pulse together hazelnut flour and powdered sugar for about 30 seconds. Divide in parts if food processor is not large enough to fit everything at once. Sift the mixture into a clean bowl. Set aside. Place egg whites in a mixer bowl. Whisk until slightly foamy on medium speed. Add a pinch of cream of tartar and whisk to incorporate. In a steady stream, add sugar. Once all the sugar is added, increase speed to high. Continue to whisk until stiff peaks have formed. Peaks should be shiny and smooth. (If using fresh egg whites vs. carton egg whites, the peaks should form fairly quickly). Transfer the egg whites to a clean bowl. Sift a third of the dries into the egg white mixture. Carefully using a spatula fold the dries into the egg whites. The dries do not have to be fully incorporated at this point. Sift the next third of the dries into the mixture. Continue to fold. Lastly, sift the remaining of the dries and fold. Continue to fold until the dries are incorporated with the egg whites. Be careful not to over-fold, otherwise the batter will be too runny. Line sheet pans with Silpat (or parchment paper). Using a piping bag fitted with an Ateco 304 tip, pipe 1-1.5 inch circles. Once the sheet pan is full, tap the bottom of the sheet pan to get rid of any air bubbles. 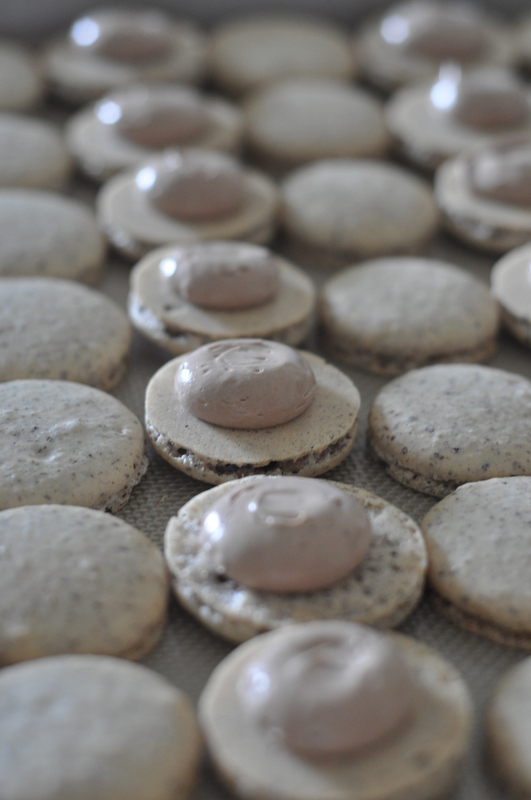 Once all the batter has been piped, allow macarons to rest at room temperature for 45 minutes to 1 hour. Bake at 300F for 10 minutes. Rotate and bake for another 6.5 to 7 minutes. Once cooled, fill with hazelnut buttercream. 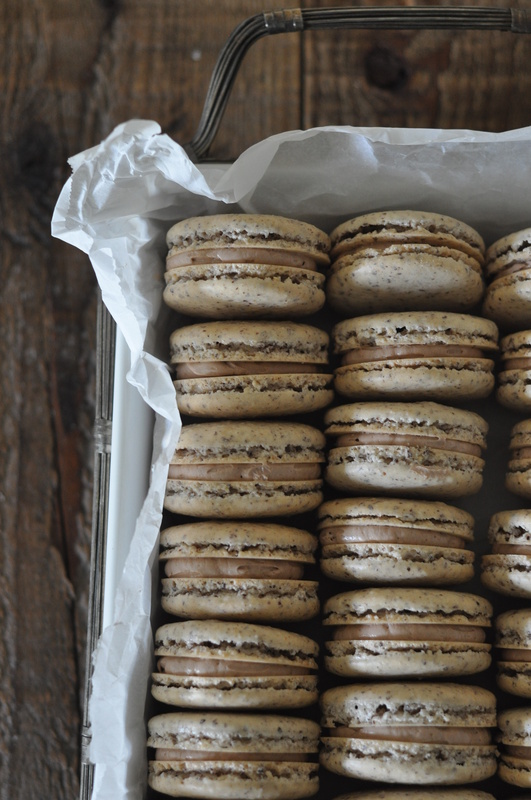 Filled and sandwiched macarons can be kept in an airtight container in the refrigerator for 3-5 days, or in the freezer for a 1-2 months. When ready to eat, always bring to room temperature. 8 oz butter, softened and cut into pieces. Add the Nutella, one tablespoon at a time to the buttercream. 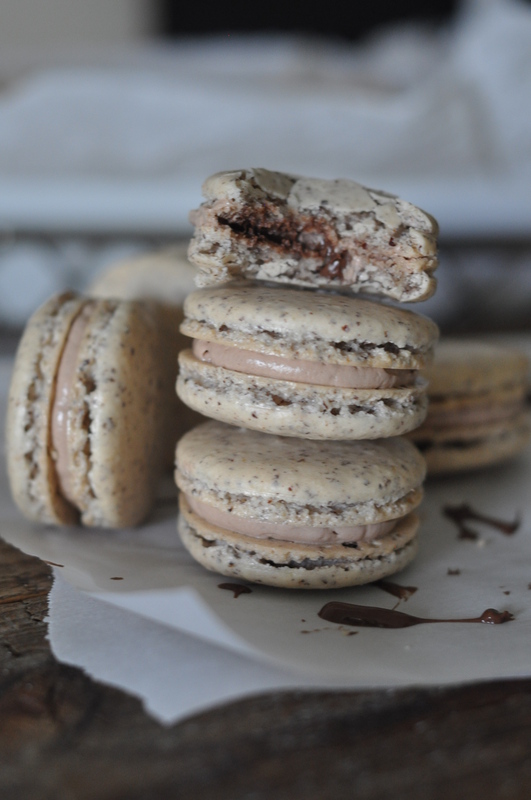 If you like a more sweeter, nuttier flavor, add more Nutella. I want to make these !